Wow! I’ve been so busy lately. I’m not neglecting the blog, I promise! I’ve been working on some side projects, including a couple major posts for the site! Anyhow, it’s Friday so let’s scan the internet together for some updates from the world of video game music and audio. This is a shameless plug but I just performed in two shows with my video game/nerd cover band, Beta Test Music. After about 1.5 years, I’m excited to announce we actually have a real proper website. Take a look! An important decision was made in Canadian courts about the proper handling of video game music royalties. 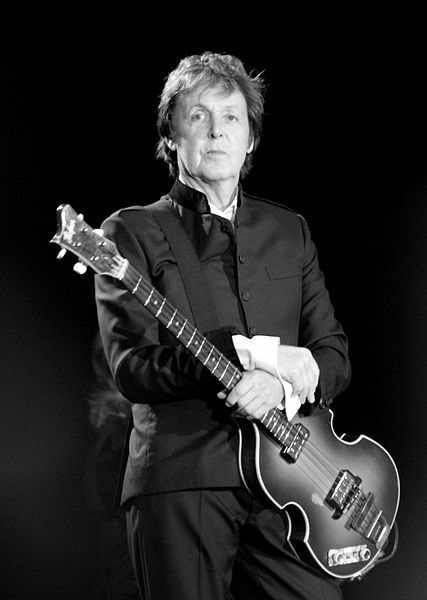 Sir Paul McCartney announces on his twitter account that he will be writing music for an upcoming video game for Bungie. Composer Jim Guthrie (of Sword and Sorcery fame) offers encouragement to aspiring game composers in his interview with The Verge. GamerLive.tv’s Alex Martinet asks the question “Do we look at video games soundtracks as a whole or as background noise?” To help him answer this question, he interviews the composers behind Mass Effect, as well as the composer behind Dragon Age. Jeremy Soule wins ASCAP’s Top Video Game award for his work for The Elder Scrolls V: Skyrim. Here’s an interesting “local” perspective on the composer. Okay! Lots more to come next week. Enjoy the weekend and play some video games. It’s too hot out there. It was relatively quiet this week… but I have a feeling things will be heating up with E3 on the way. Here’s what happened this past week in the world of video game music and audio! An article on The University of Maryland’s 123-piece volunteer video game orchestra. Vote on IGN for your favorite video game theme song! The winner will be included on the next London Philharmonic Orchestra game music album. Guardian UK blogger Keith Stuart discusses the soundtrack to Max Payne 3, provided by the US punk band Health. Time magazine’s write-up on last weekend’s Blip Festival 2012. Here’s what happened this past week in the world of video game music and audio! Want to hear some chip-tunes related goodness this weekend? Then check out Blip Festival 2012 in NYC starting today, May 25th and running until Sunday the 27th- check the link for details. Here’s a write-up in Popular Mechanics about all the goings ons. I’ll be rooting for fellow Philadelphia-based artist Chipocrite. Here’s a little piece in the LA Times by Jamie Wetherbe highlighting the Pacific Symphony, the orchestra that provided the soundtrack to Diablo III. Video game musician Mega Ran/Random’s (Raheem Jarbo) new album, Language Arts: Volume One, looks to be awesome. It’s an album, a comic book, and a video game. Here’s a write-up in Kotaku. Spain awards Shigeru Miyamoto their prestigious Prince of Asturias award. Lastly, Peter Gregson, Daniel Jones, and the Britten Sinfonia Orchestra are going to make music out of people’s tweets. Have a good weekend, folks! For you US people, have a good Memorial Day! Tech-Faq reports on programmer David Cope’s “Emily Howell”, a completely computerized “virtual composer”. Though an older article, here’s a more in-depth interview from 2010 with David Cope. Gaming Blend interviews Darksiders 2 composer Jesper Kyd. Dead Space composer Jason Graves and Gears of War composer Kevin Riepl join forces to score the soundtrack to PS Vita’s new FPS, Resistance: Burning Skies. Blogger Phendrena of Retro Game Music celebrates the 30th anniversary of the Sinclair ZX Spectrum with a 7-part blog post tribute- Part 1, Part 2, Part 3, Part 4, Part 5, Part 6, and Part 7. A must read for fans of this great computer, trust me. A posthumous look at African-American video game pioneer Jerry Lawson, creator of the Fairchild Channel F- the first console to use cartridges. This is over a month late but here’s a Kotaku interview with new Halo-series composer Neil Davidge about his upcoming score for Halo 4 . Australian composer and musician Chris Vik talks about “hacking” the XBox 360 Kinect and using its abilities to generate audio. Very interesting read. Well, that’s all there is to report for today. Have a good weekend, folks! Silent Hill composer Akira Yamaoka talks about the decline of the “Japanese video game” in a recent interview with Edge-Online. An interview with symphonic director/founder of Video Games Live Tommy Tallarico about his recent performances in the Mid-Atlantic region. Gamasutra reports composer Robert Holmes (of Sierra-Online’s Gabriel Knight series) and developer Jane Jensen (known for the same series, as well as Kings Quest IV and she also happens to be married to Robert Holmes, hah) are launching a new company to bring back adventure games. An interesting write up in the Denver Post about Symphony of the Goddesses featuring some quotes from director Jason Michael Paul. Last but not least, my lovely little video game chamber ensemble, Beta Test Music, will be featured in a showcase this Saturday night, April 7th, in Philadelphia. For details, take a look here. We’ll be playing some interesting duets as well as new versions of my Super Mario Land arrangement and Final Fantasy III (JP) Battles arrangement (links will let you listen to the tracks for absolutely free!). Come on out if you’re in the area. Tickets are free in advance and $5 at the door. Have a good weekend, folks, and a good Passover/Easter if that applies!